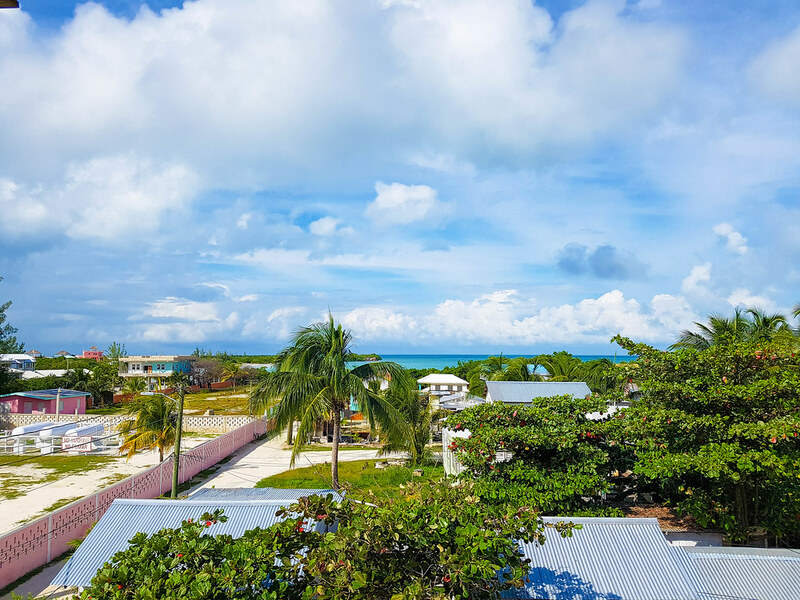 Caye Caulker is the definition of “go slow” and no wonder, as the main activities on the island are sun tanning, snorkelling, diving and eating lobster. And as Lonely Planet would suggest, swinging in a hammock and enjoying the breeze is a national sport in Caye Caulker. When I booked my flight to Central America I had doubts about visiting Belize. On one had I wanted to, after seeing all those beautiful pictures of the Belizean islands, but on the other hand, everywhere I was reading how expensive the country is and how you can’t really do it on a budget of less than £50 a day. Plus, there was a quite high exit fee as well. However, when I found myself in Guatemala I realised that it was only logical to continue my way up to Mexico was via Belize, so I decided to spend the New Year’s Eve on a beach, in Caye Caulker. After a bit of a border crossing issue, where I was almost not allowed into the country because the immigration agent thought my country was made up and kept asking for my real passport, I was finally granted a 5 days visa to Belize. It was enough and there was no point of argue and ask for my rights of a month-long visa, when I knew I was only going to be there for 3 nights. I didn’t really have a plan for what I wanted to do on the island, but I knew I wanted to be in the water for as long as possible. 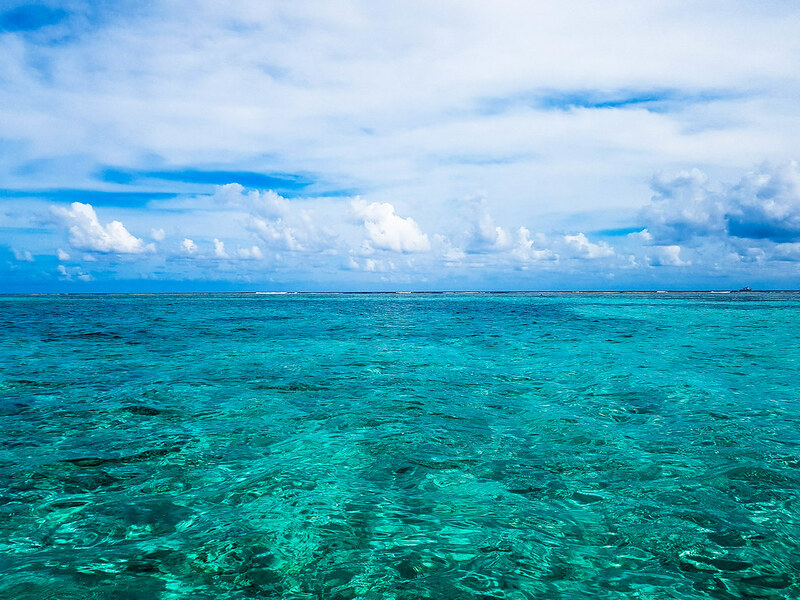 After all, you can never say no to the beautiful azure colour of the Caribbean Sea and you can’t miss the second biggest coral reef in the world. I arrived in Caye Caulker in the afternoon, after a 40 minutes speed boat ride with the water taxi from Belize City. 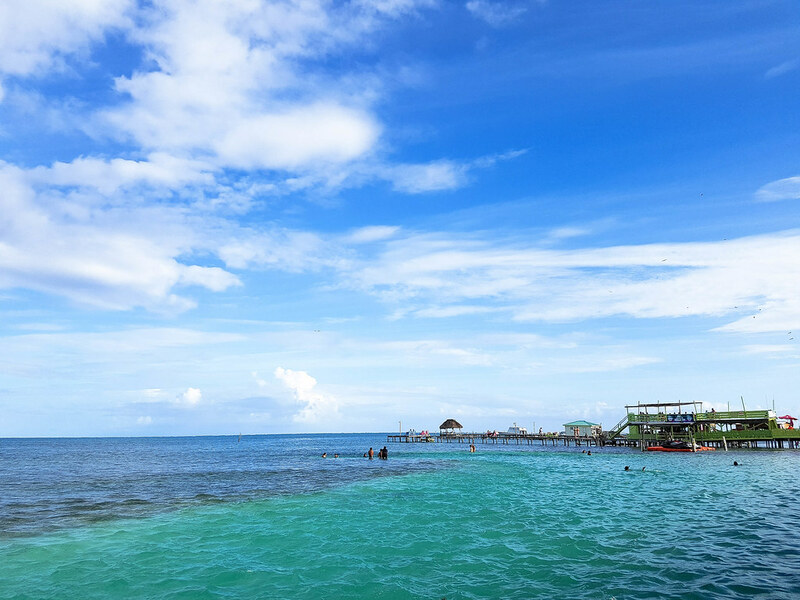 As I got off the pier and stepped onto the white sand I immediately noticed the chilled-out vibe of Caye Caulker, when I had to wait for my luggage to arrive, 15 minutes later, on another boat. The first thing I noticed about Caye Caulker was that there were no cars on the island, only golf carts, so the best way to explore is simply by walking. Second, everyone was super friendly. Third, the reggaetón. I booked Travellers Palm Backpackers, a hostel situated just a 10 minutes’ walk from the ferry terminal and another 10-15 to the Split. Being in a quiet area, with direct access to the beach, free kayaks and a nice rooftop terrace, at $13 a night it was a bargain, especially over the New Years Eve. The rooms were quite large, with private bathrooms, fresh drinkable water dispensers, solid wooden beds and personal fans. As soon as I arrived at the hostel, I changed into my swimming suit and headed for the beach. Unfortunately for me though, the sun went into the clouds quite quickly and forced me to head back towards the centre of the village. It wasn’t bad though as hunger took over my stomach, so I stopped at the first restaurant on my way, Enjoy Bar and Restaurant, where I had my first (and last) lobster of my trip to Caye Caulker. 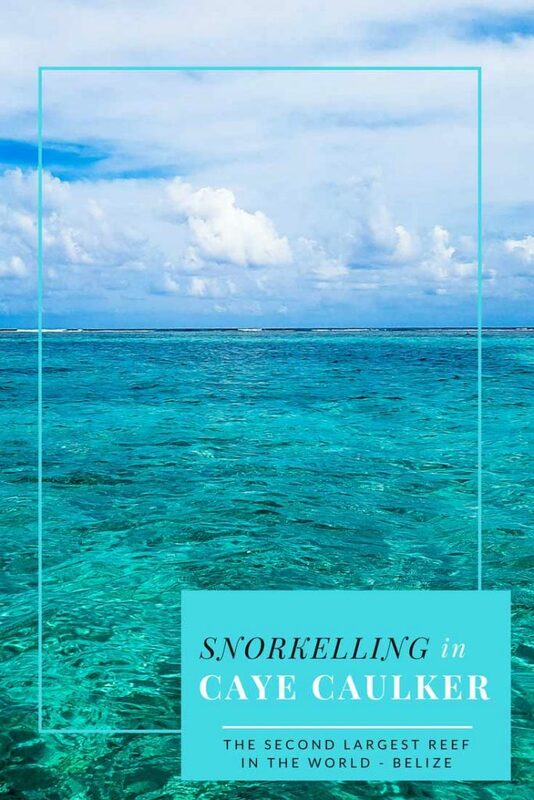 How to choose a snorkelling tour in Caye Caulker? 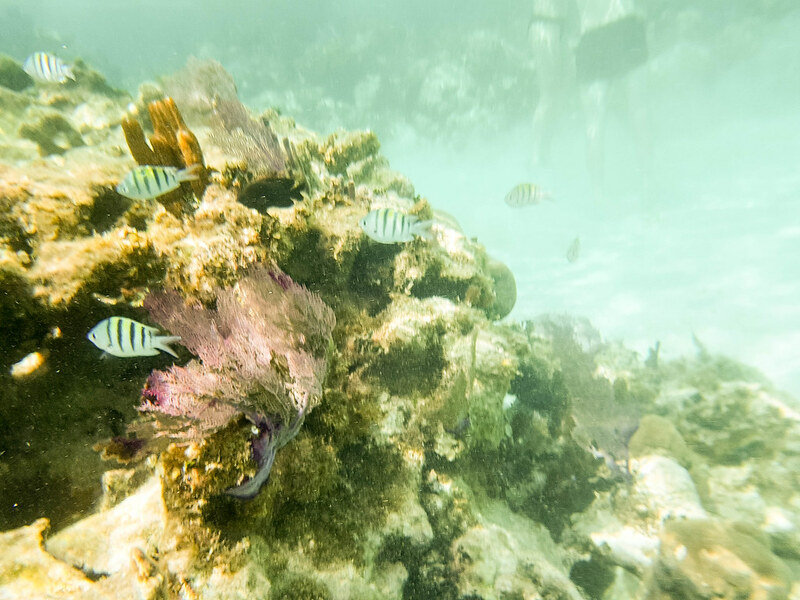 I knew I wasn’t that great in the water and I wasn’t sure how my motion sickness will behave, so I went for the half a day tour, around Caye Caulker Natural Reserve, with 3 snorkelling stops, water and fruits included. It was 31st of December and I didn’t know how many tour operators would work, so I woke up early to go shop around. As I was having my cup of coffee, one of the locals, friends with the hostel’s receptionist, joined me and said that the shop he was working for was going at 10:30. Funny thing though, as he was telling me about how beautiful the reef is, he was also rolling a joint, which he smoked later. He also confessed that his license expired the same day, so he was going only on a half a day tour, so he doesn’t get caught. Now, I started to ask myself if I really wanted a guide who was high while in the water…. Luckily an Italian tourist joined our conversation, so we left together to shop around for a tour. There are a few tours to choose from, the most popular ones being to the nearby Caye Caulker Marine Reserve and Hol Chan Marine Reserve. 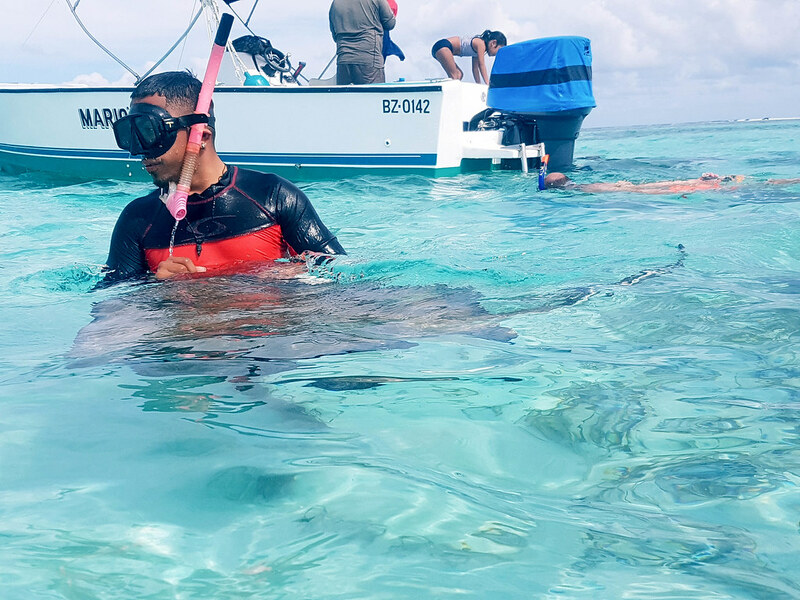 Here you can observe the corals, swim with sharks and stings rays, and, for an extra fee, go and see turtles. Another tour you can choose from is swimming with Manatees. These tours are usually priced at around 70-80 Belizean dollars for a half day, and around 120 Belizean dollars for a full day, including lunch. 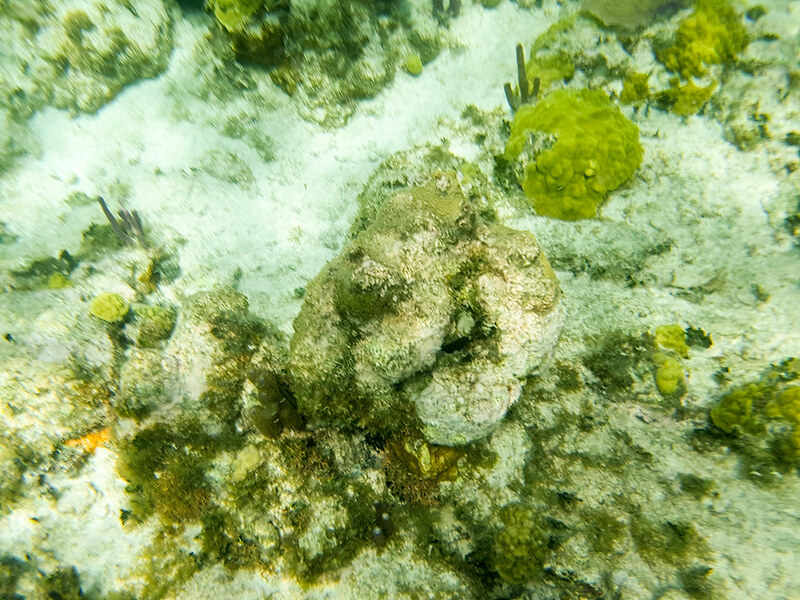 A few companies also organise snorkelling trips to the Blue Hole as well, but besides the fact that they are very expensive, you can’t really see much inside it. The Blue Hole is best experienced by plane or by diving. 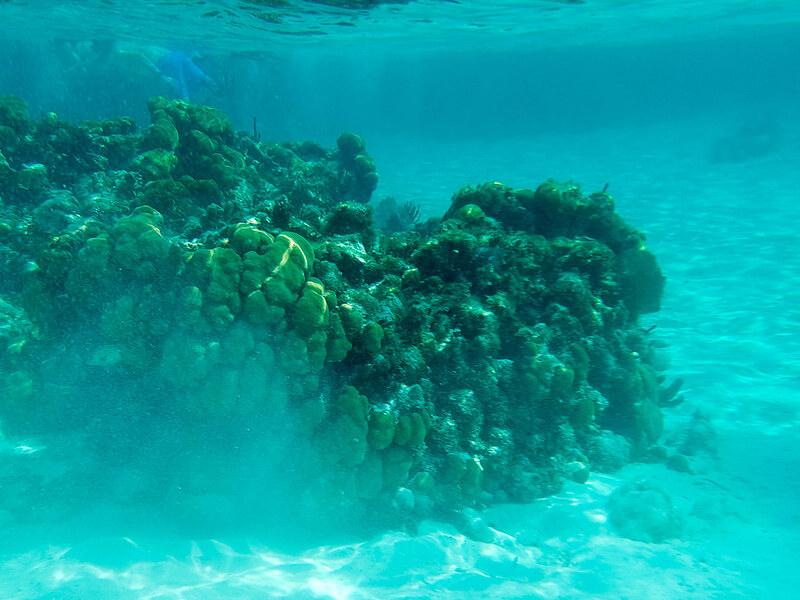 We went for the cheapest tour we could find in a very short time, so we ended up snorkelling with Mario’s Tours. Diving in the Blue Hole? If you have the open water PADI certificate you could choose to go on a dive at the famous Blue Hole. However, be prepared as it is a very expensive experience. Going diving at the Blue Hole with one of the best diving shops on the island, Belize Diving Services, will cost you around 400$. US, not Belizean! If you want to see it from above you can always experience a scenic flight over the Blue Hole. Don’t go diving to the Blue Hole if you are not a confident and experienced diver. It is not another place to check on the travel list, it can be quite dangerous if you don’t have the proper training. And whilst some of the companies on the island will take you without the PADI certificate, don’t risk your life doing it! We boarded Mario’s small and basic boat and listened careful to how the day was going to plan out. “Everything that you will leave on the floor, will get drenched”, so everyone hurried to put their backpacks in a cupboard at the front of the boat. “If you have a cap, wear it backwards, otherwise it will fly over as soon as we leave. And don’t forget your sunscreen!”, so everyone rushed back to the cupboard from the front of the boat, to get their sun protection out of the backpacks. I put my fins on my feet, set my mask over my eyes and nose, made sure that the life vest was still on, and I jumped in the water. As we were too many, we got divided into two smaller groups. I was assigned to Mario’s side, so I followed him, blindly, as I couldn’t see anything through my mask. It took me a while to realise that it wasn’t me but the mask. And I was a bit horrified when the answer to my “how can I clean my mask” question was “spit on it”. 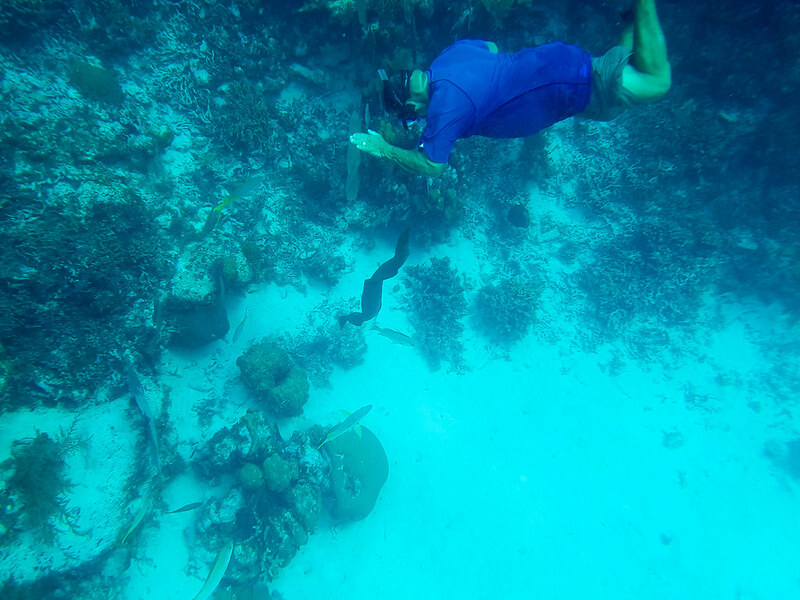 I did it though, just in time, as Mario dived into the reef and fast came back to the surface, followed by a massive eel. “He came to get me; did you see that?”, Mario laughed. Mhm, we all shook our heads in approval, a little bit terrified of how pissed off that eel must have been to be disturbed from its afternoon nap, to get out of under his rock and follow Mario almost all the way to the surface. If you have never seen eels before, they are not pretty to look at. They are black, with a snake-like flat body, and a sharp tooth in the middle of their mouth. And because of that tooth they seem to be smiling all the time. Creepy! I didn’t want to get lost (yeap, there were a few groups in the same time in the same area), I followed Mario quite close, trying to take some underwater photos in the same time, testing my mobile phone underwater case. Spoiler alert, it doesn’t work as the touch deactivates and acts randomly at the contact with water. I wish I could have read this post about how to take better underwater photos before and not after I went snorkeling. 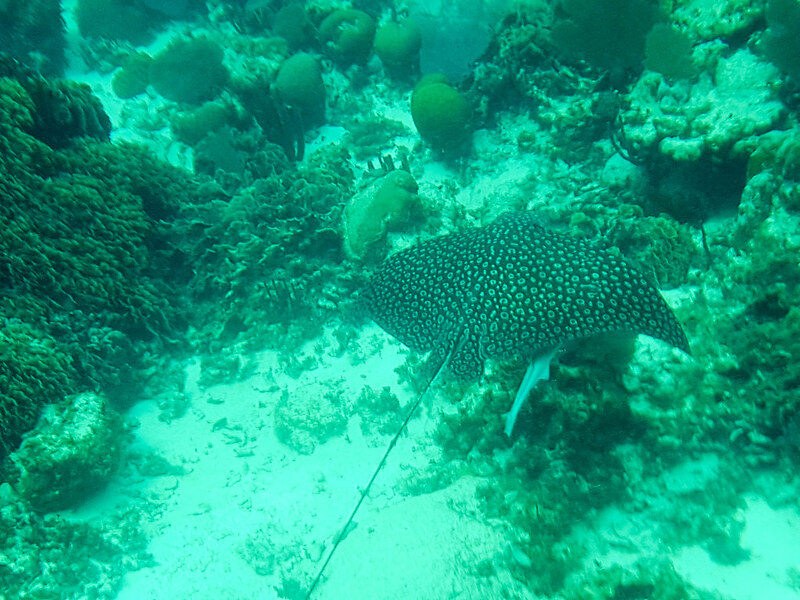 Anyhow, at some point, while I was fighting with me camera, Mario suddenly pulls my arms and drags me towards him, pointing at the corals below me… where a nurse shark was just passing by, undisturbed, followed randomly by an eagle ray with a fish underneath it. And I was the only one who was able to enjoy this amazing sight, because I was the only one swimming around our guide at that moment. As impressive as the next stop was, it was unethical and totally wrong! And I didn’t know that this would happen. Unfortunately, about 99% of the shops on the island will do it and during my stay I have only seen one ethical snorkelling company that refused to use plastic on their boats and also refuses to feed the fish (Reef Friendly Tours)! 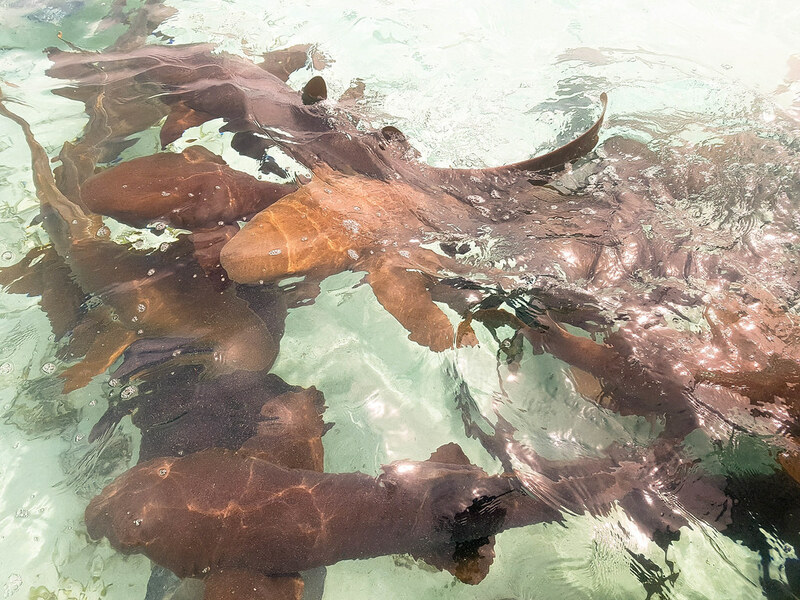 Because as soon as the boat reaches the shark and sting ray alley, the guides start to throw food into the water so that the fish gather around, for the tourists to see. The water here is very shallow, so it gets really crowded. Feet, sharks, sting rays, someone’s body, a sting ray climbing on top of someone’s body, screams… It’s a total mess! After enjoying some fresh fruits on the boat, whilst going full speed through the incredible azure water, we reached the South Channel, the last stop of the trip. Here we had free time, about 45 minutes in which we snorkelled on our own, through the reef, observing the beautiful colours and trying to spot fish among them. On the way back, we passed through the Split, watching the people enjoying the sun, and headed over to the other side of the island, to see the tarpons. Here, again, as soon as the boat reached the area, the fish surrounded it. They know that when a boat comes it’s feeding time. To keep the tourists entertained, the guides were giving out sardines, showing how to hold them so that the fish jump out of the water and grab them directly from your hand. Again, nothing ethical about this either, and it seems that almost all the operators on the island are doing it. However, a good thing is that the tarpons are protected and it’s illegal to fish them. 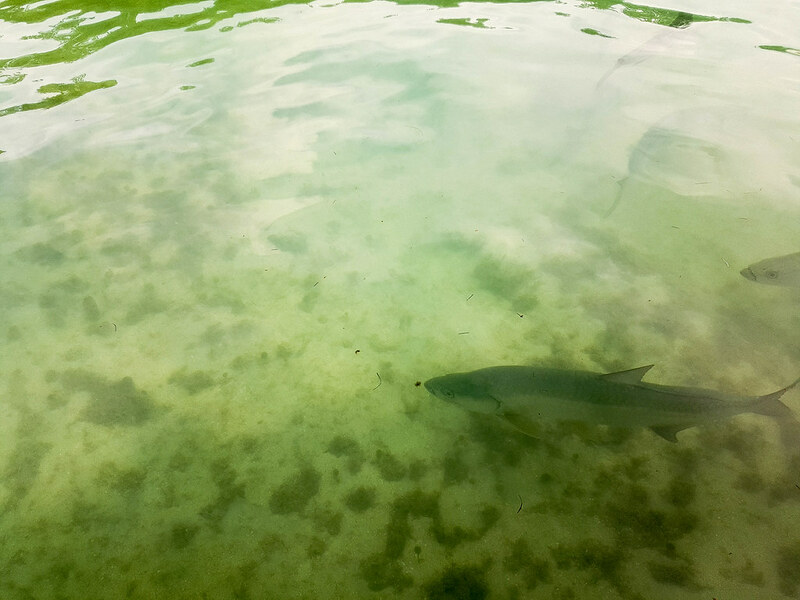 The tarpons are huge fish, the one surrounding the boat measuring probably at least one meter long. The sun is very powerful, especially at midday, when you are in the water. Bring a strong, waterproof sunscreen with SPF at least 50, and reapply it every time you get out of the water. As a woman, I would recommend you a full body swimming suit, especially if you are planning on wearing a life vest during the times you are in the water. Two-piece suits are great, but you have much more mobility and care free (if you know what I mean) by wearing a full body one. If you have a history of motions sickness, like I do, don’t forget to take your tablets 2 hours before you get on the boat. Whilst you might be ok during the actual boat ride, changing the perspective so often by looking underwater and then coming back out at surface will trigger the dizziness. Better safe than sorry! Check if your tour company will provide fresh water and if they don’t, make sure you bring a bottle with you. 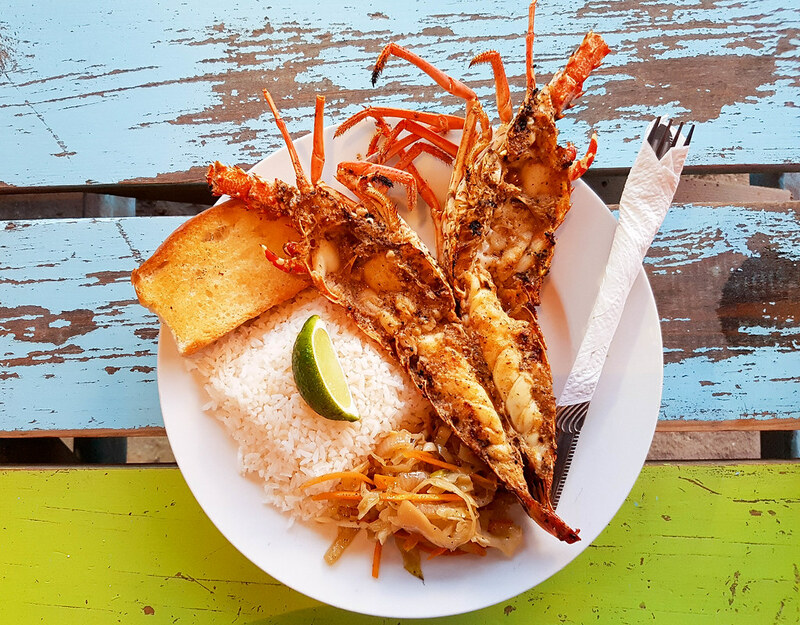 This is where you will find the cheapest lobster on the island, with prices starting at 20 Belizean dollars (10$) for a small one (which is enough for one person) accompanied by three side dishes: garlic bread, coconut rice and stir-fried vegetables. If you arrive during happy hour you can also enjoy two very strong cocktails for 7 Belizean dollars. Remember I told you that this was the first and the last lobster I had on in Caye Caulker? That was because apparently, on the 1st of January, nobody went fishing! Call it a relaxed island, heh! While all the restaurants were open, none had lobster. On the island which is famous for lobster! The speciality of La Cubana is actually the roast pork and not the fish, but I wasn’t feeling like ordering an all you can eat dish. Every night, they roast a suckling pig which you can have together with 2 sides and 3 glasses of rum for an affordable price. My plate was cooked nicely and came with two sides, coconut rice and mashed potatoes. It wasn’t a dish to remember, but it was tasty. The location was nice as well, right on the beach and I was lucky to enjoy the full moon rising as I was having dinner. KoKo King is situated on the other side of the split and you can easily reach it by boat. It’s the perfect place to spend the entire day if you want to be lazy and just sunbathe. 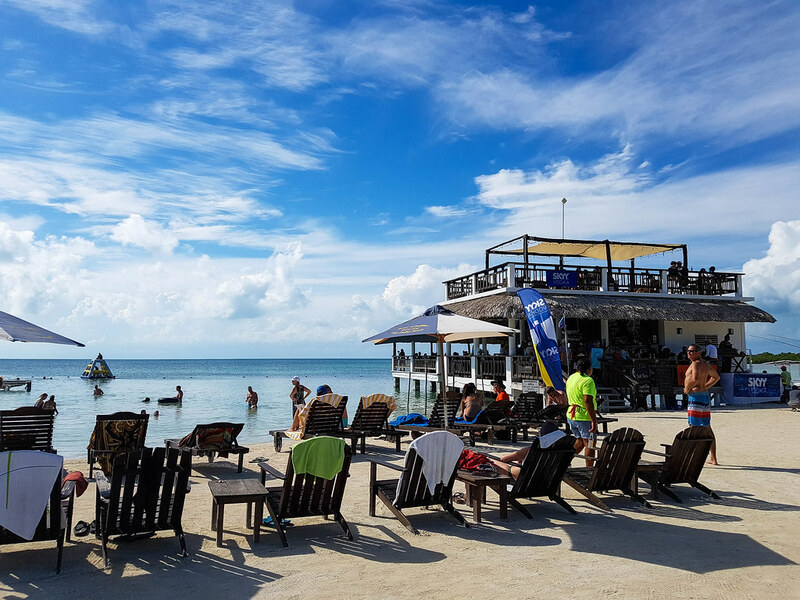 The only things you have to do to take advantage of the free boat and the free beach chairs is to spend at least 10 Belizean dollars at the bar, which is very achievable, as most of their meals are over 15 Belizean dollars. Fryjacks are the cheap meal of Belize, and they are delicious! You can have them for breakfast, lunch, even for dinner! A fryjack is a deep fry dough shaped as a triangle and filled with cheese, chicken and beans (or any combination between the three). They are huge, delicious, filling, and they only cost around 3 Belizean dollars each. You will always encounter a queue at Errolyn’s House of Fryjacks, but it’s worth it, they are the best on the island. Until recently, the Split was the place to be in Caye Caulker. These days is at competition with KoKo King. However, the atmosphere is great in both places! 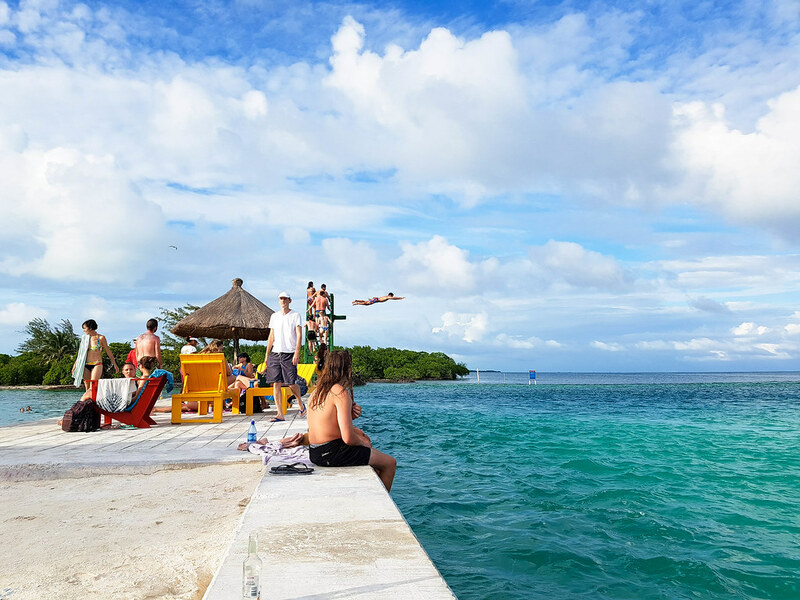 The Split is a beach bar with a volleyball court, a trampoline to jump in the water, plenty of floaties and space to just lie in the sun. The Split is a great choice at any time, day or night, as the party never seems to stop. 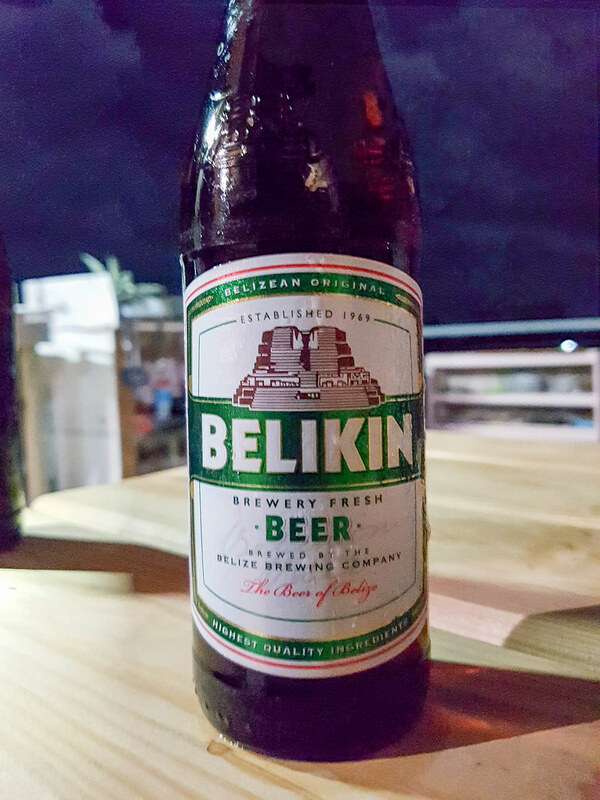 Belikin is the national beer of Belize, and you will notice this as soon as you enter the country, by seeing the huge billboard panels on the road. 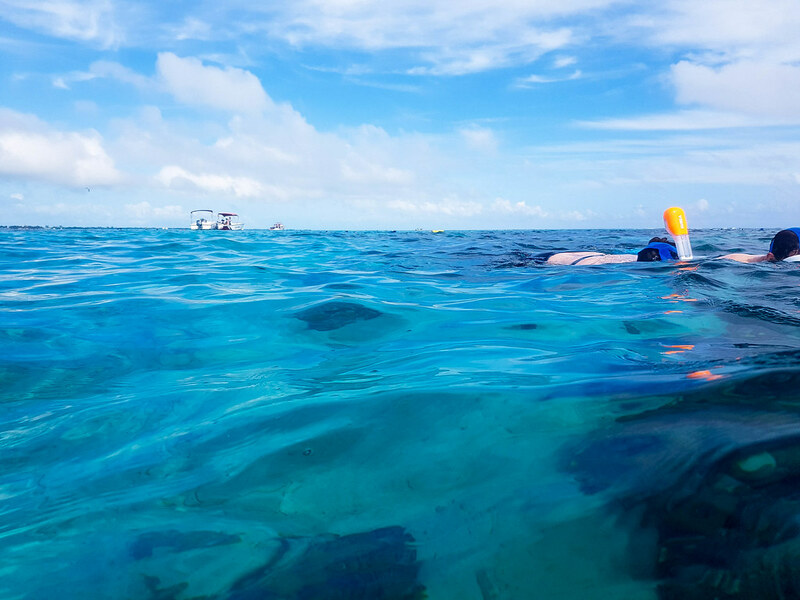 Would you like to go snorkelling in Belize? Disclaimer: This article was written in collaboration with Simply Beach. So blue! And so beautiful. 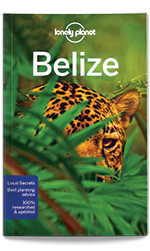 Great guide for anyone going to Belize. It is on our bucket list to dive the Blue HOle one day. Great pictures. Looks like an unforgettable trip. We loved Caue Caulker and some of the best snorkelling we’ve ever done! In fact, going back later in the year! Great post! That water looks absolutely incredible! Wow so blue and gorgeous. What an amazing experience. Thanks for sharing! Ahhh Belize, I have a real soft spot for this place – the first country I back packed to aged 17. That was 14 years ago now but I remember Caye Caulker well and your beuatiful photos took me right back! This article is so timely as we are planning a trip later in the year! I love the brightness of the photos and will be taking on all your pointers and advice! Thanks a great read! What an experience! I’m not very good at snorkelling so I really applaud you. The deep waters scares me. But oh my, that view of the Blue Hole is really something else. At least you got to see the Belize Barrier Reef. Would def want to see it too someday. Wow this looks absolutely amazing! Will have to put it on the list! I have been snorkeling in Southeast Asia and specifically loved Koh Lipe in Thailand since it was all straight off the beach and really easy for beginners. 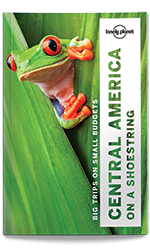 Would love to visit Central America, thanks for sharing! Pinned for later because this water looks pristine! Such a beautiful place to snorkel. I might just need to sail there next year 🙂 I especially love eagle spotted rays!! Wow! Belize has always been outside my radar and now I’m asking myself Why?! It looks A.M.A.Z.I.N.G! I’m so glad to hear that you’re recommending tours that don’t feed the fish. It’s one of my pet peeves of tours of this kind and it really upsets me. We need more awareness on this. But what an incredible experience! What an amazing snorkelling trip with such a range of sealife! I’ve had mixed experiences snorkelling around the world, it’s so sad that coral reefs are dying. I don’t think I’ve ever gotten used to spitting in my mask to clean it but it does work! I was writing about this place for a client the other day and now I really want to go! Thanks for all the tips! I really want to visit Belize and snorkel (or dive) in that amazing turquoise water! 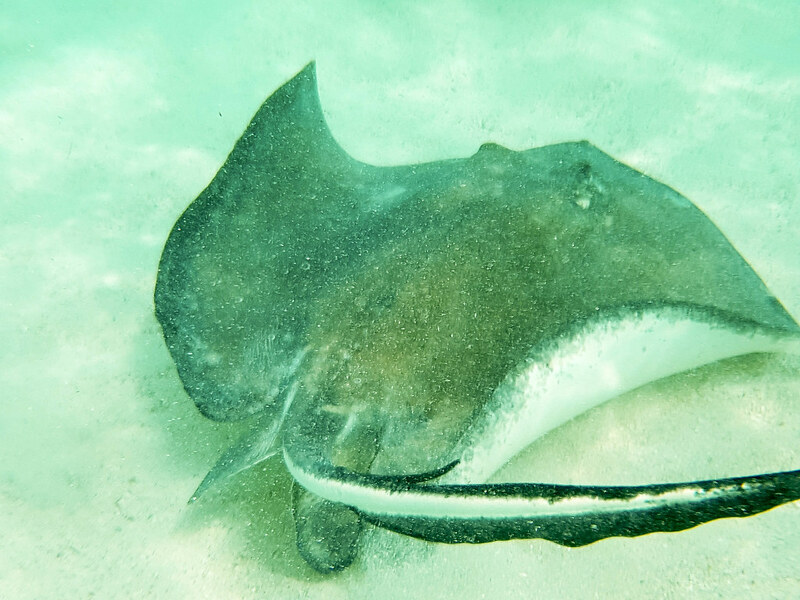 However, I’m really disappointed to hear that they are still feeding the fish at Shark Ray Alley and at Tarpon Point (though, I’d not heard of Tarpon Point before reading your post). I hope to find a snorkel outfit that avoids these areas or at the very minimum, doesn’t feed them. It sounds like it will be tougher than I expected! I will check out the place you mentioned when I am (finally) planning that trip. Now that looks like the dream destination! Stunning! 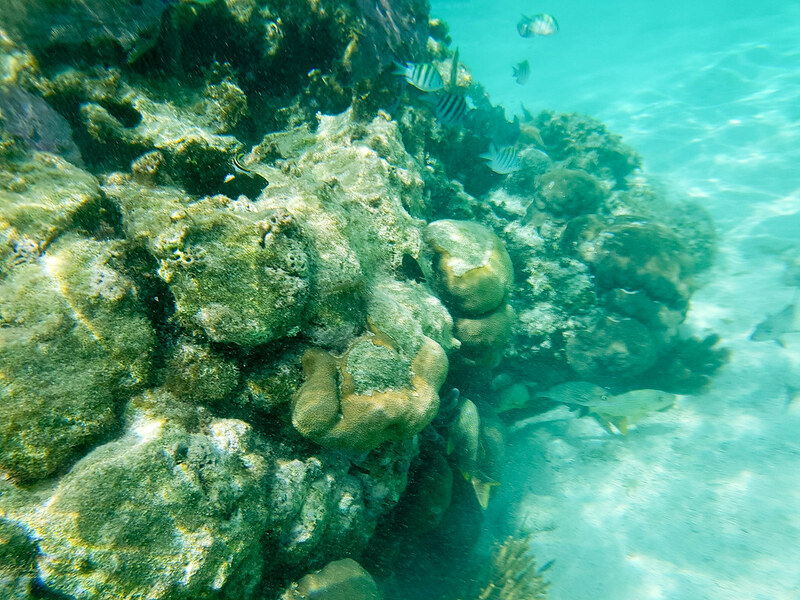 Living along the gulf coast of Florida, we enjoy snorkeling often. This place looks like the place to snorkel! I love all the different fish and reefs that are available to see there. 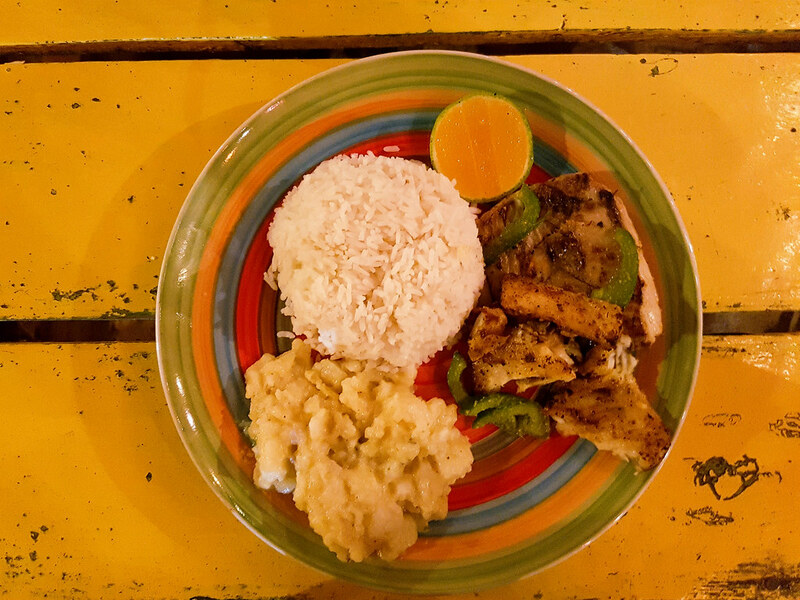 Fresh seafood is always a must when staying and/or living at a tropical destination. I still can’t figure out why we even have a Red Lobster or Captain D’s here! Fresh local seafood is where it’s at!! This looks amazing. Snorkelling is on my bucket list, I would love the opportunity to do it one day. This location is beautiful! Belize looks so dreamy! Ever since my friend visited, I have been wanting to travel there! Your photos are breathtaking! What a view!! The food especially the lobster looks so delicious and yummy, glad you all enjoyed your snorkelling holiday to Belize. That immigration agent must have been American educated. And never feel bad about wearing a life jacket,I would have done the same thing! Beautiful pictures as well….. 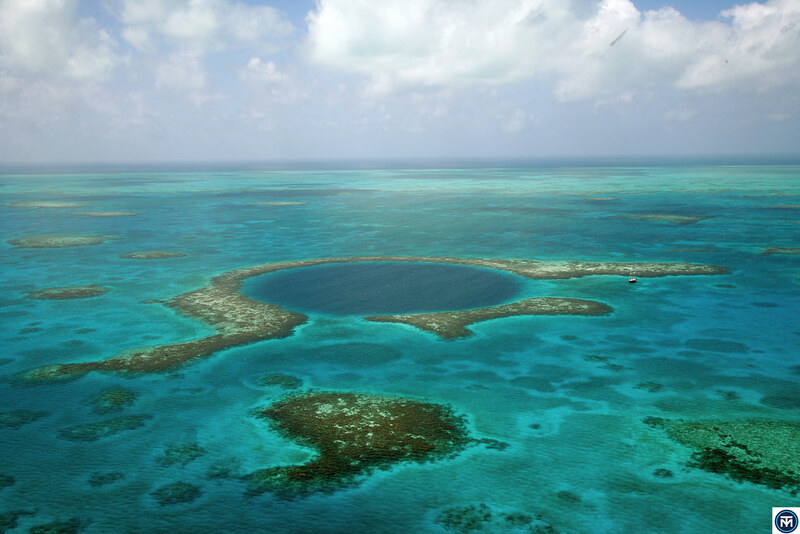 I was reading about Belize over the weekend for a post I was writing and I fell in love it is such a beautiful place and that sink hole I bet it is just amazing to get to explore. That water looks so incredibly calming and amazing. I would love to experience so much beauty – some time to decompress and be one with the water/nature. Wow! This sounds and looks like such a gorgeous trip! Some fab memories were made i’m sure! Thanks for sharing. Oh my gosh! That water is so perfect! It looks like you had an amazing time, I would love to go there! This looks amazing! Havent seen water this clear since I was away in Mata! After seeing this, I need to take a trip to Belize. The pictures you’ve taken inspire me so much! That blue is absolutely pure! I wish I wouldn’t be afraid so much of water and experience all these moments you enjoyed. The photos are amazing and stunning! I bet it was a great adventure and experience. That Blue Hole photo is breathtaking! I’ve never been to any places in the Caribbean so I’ll be adding this to my bucket list. It looks like a fun place to spend a vacation. Amazing underwater shots. This post makes me want to visit this place at least once in my life. REALLY REALLY REALLY want to visit Belize! It has been on my list of places to visit and this just makes me want to go that much more! These are some wonderful destinations….I love travelling & will surely visit these places. Amazing underwater shots !! What an adventure and you packed so many experiences into your short stay in Belize. 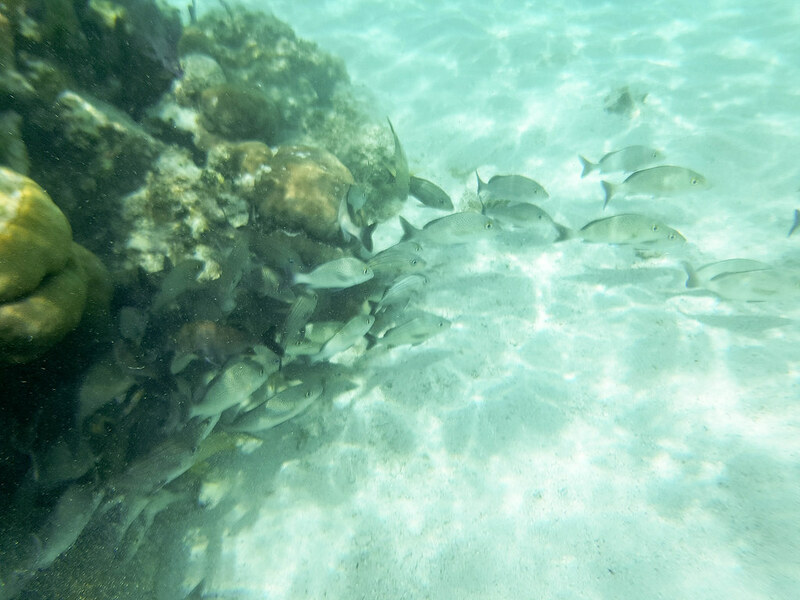 Your photos are stunning – I might even be persuaded to try snorkeling one day! Wow, how nice! I dream of going to Belize one day. Before that, I have to enroll in the course of diving, it is one of my life’s wishes. I was recently invited to take a trip to Belize and was foolishly hesitant to go! I’m definitely considering making that trip now. Thanks for the useful information. I visited belize in December. I desperately wanted to visit Caye Caulker but instead went to kumumba beach. Love the pictures. Hopefully I can visit there a next time. That Blue Hole looks insanely beautiful. The Caribbean always makes me so dreamy, seeing your pictures makes me want to have a real vacation though! Love this post as it helps to remind me to slow down and smell the flowers. In this case, to slow down and dive in the water! Beautiful photos, great post. I am now booking a trip to some where tropical 👍🏼😍Thanks! so beautiful. Great guide for anyone going to Belize!! I can’t believe I haven’t go to Belice it’s so close to my country Honduras. I love that you touched on dive light places, or not so swimmer confident options. My fiance is not a swimmer and I love to go diving, snorkeling, and be on a boat all day, so finding the perfect medium for the both of us can be hard sometimes. Pinning this! All these pics are making me crave a holiday so bad right now! It looks like paradise, and certainly a perfect place to go snorkelling, with that beautiful clear sea.